It's been a while since my last post on home brewing, so I thought I'd provide an update on my most recent and also upcoming adventures. 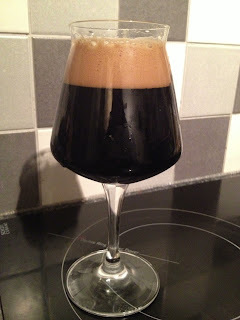 My fifth all grain brew, Imperial Stout, didn't quite follow the path I described. The base beer itself turned out well. Beyond that, I sat it on some dark roast coffee beans and some French oak chips that had been soaked in Maker's Mark Bourbon. The chips were soaked for about 5 days and the beer was sat on the coffee/oak combination for a week. The beer at that stage had a massive coffee nose that over-powered everything, although this was less present on the palate. The feedback I got was that it needed to be a little sweeter, so I decided to introduce cocoa to the mix. Like most things in home brewing, there are many ways to add cocoa into a brew but given where I was, my only real option was to rehydrate some dried cocoa and mix it in. Now, given this brew was for my wife, I felt compelled to use her favourite cocoa (Cadbury's) for this, although that went against the advice I got to use low fat powder to avoid head-killing oils getting into the final product. I gambled on that point and went for it, adding 100 grammes of rehydrated cocoa after transferring the beer off the coffee and oak chips. Then I left it for another week before bottling. The resultant beer is probably my best to date. I think using a starter gave me a good, clean fermentation and the coffee and cocoa combine well on the palate and on the nose to provide decent flavour with hints of oak coming through right at the end. My only error was that it seems some of the bottles have over-carbonated. This is probably due to not ensuring my priming sugar was evenly distributed. The photo above shows a pour of the final beer. My sixth all grain brew was effectively a revisit of my third, which went a bit wrong (see previous post) and had to be ditched. American Pale Ale is a favourite style of mine and screwing this up had been playing on my mind as I was happy with the recipe and confident I could make a better fist of it with a second attempt. I tweaked it slightly and had to tweak it further on the brew day as I misplaced some Maris Otter (of course I found it 10 minutes after I no longer needed it) so subbed in some DME at the start of the boil. Here's the final recipe (left, click to enlarge). The brew day went very well but I learned that using pellet hops in the boil with my set up is not a good idea. The pellets didn't settle out properly in the cooled kettle, so I lost a lot of wort leaving the trub behind while transferring for fermentation. In any case, fermentation went well with another first for me - dried yeast! 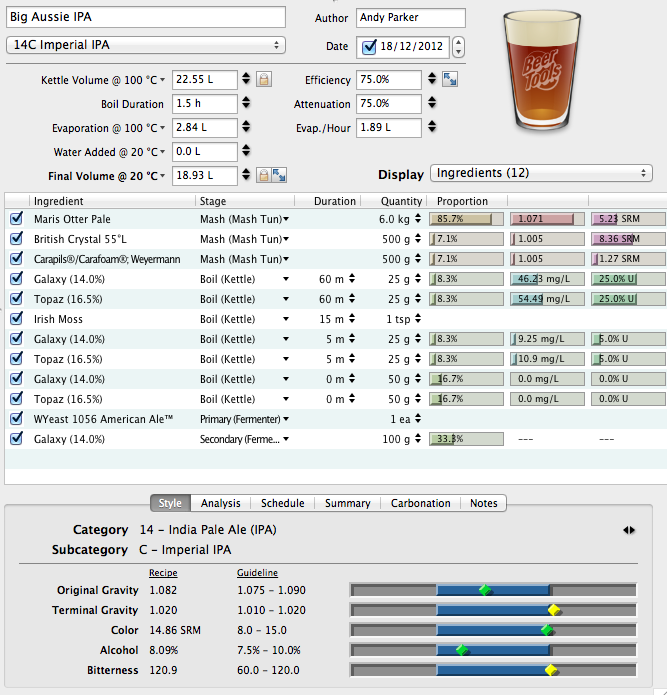 The starting gravity was a bit high (1.060), probably as I added too much DME, but I didn't liquor back. The final beer is 5.9% and has just been bottled. The Centennial dry hops and late Apollo addition have combined to give it an aroma that reminds me of those fruit salad penny chews I used to eat as a kid, and I'm happy about that! 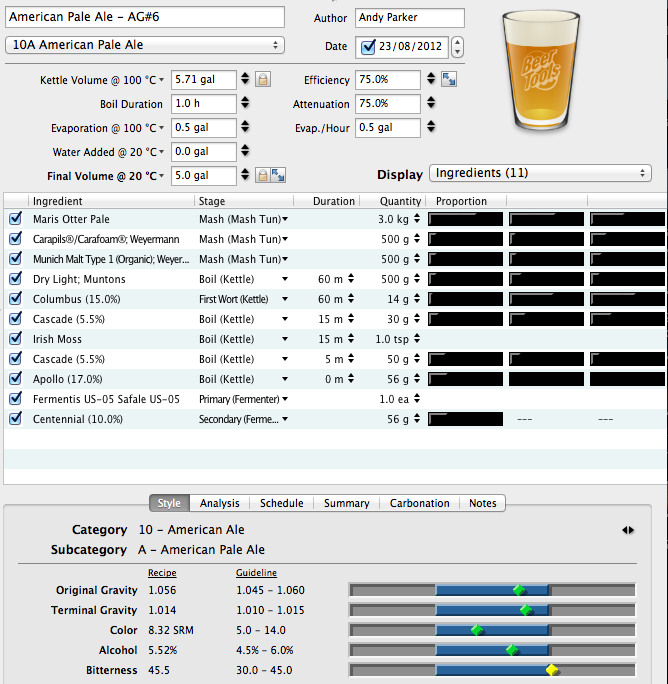 The final update I wanted to provide was the plan for my next all grain brew. One beer I really enjoyed this year was Summer Wine's Surfing Monk, an Australian hopped Belgian blonde ale. Given I've just got my mitts on some Galaxy and Topaz and still have some Wyeast 3787 (Belgian Trappiste, High Gravity) in the fridge, I thought I'd have a go at brewing my own version. I'm thinking about splitting the batch however, and ferment ing half with my go-to yeast, Wyeast 1056 (American Ale). The draft recipe is below and I'm hoping to brew this before the turn of the year. One more thing before I sign off. The title of this post is the new name I've given my home brewery. I probably don't need a name for it, but hey, it's my brewery and I'll do and brew whatever takes my fancy, so there! It's a good name for your brewery! I can't wait to try the bottle you gifted me over the weekend, Thanks again mate! Cheers Matt and you're welcome. Hope yours isn't one of the lively bottles. Best open over a sink just in case! Top name. All good homebrew setups need a name and it will serve you well if your dreams come to fruition as well I suspect. Thanks for the encouragement Gregg. It's always very much appreciated. Strange question but I just found your blog while trying to find a gift brew journal for my hubby... 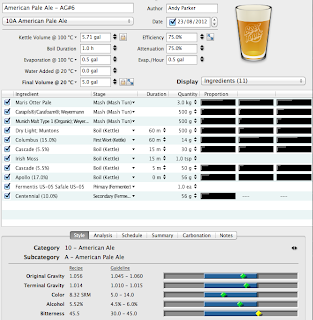 I can't find anything for people who are serious about brewing and then your image came up with what looks like a program you created/using. Can I ask what its is? Is it possible to build something like that, I'm super interested in what he is doing and looking for things to make him not jot it in random papers, thanks! I dont know why it posted as unknown, great site by the way!